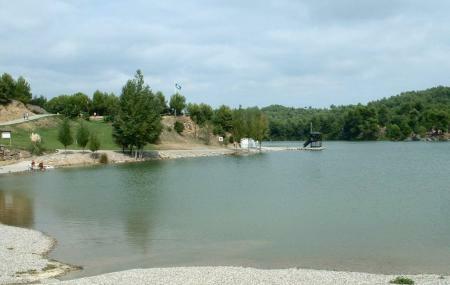 Situated around 6 kilometres from Carcassonne in France is the artificial Cavayere Lake. A walk round the lake takes about an hour. The lake has three large beaches and is also the centre of various leisure activities. Swimming, pedal boats, boating, fishing, picnics, mini golf, volley-ball, pony riding are some of the activities one can enjoy at the lake. You can also spot a number of ducks and wildfowl here. People also visit it in order to see its diverse flora and fauna. You can hire a boat and row around for exquisite views. During winter afternoons, this place remains crowded with people who come here to sunbathe. The Lake is closed off season. Check the dates with a tourist office. The food stalls and the water activity centres open by 11 a.m.
Water sports and activities may cost anywhere between €5 to €20. Bus number 1 takes you from the city centre to the Lake. Note that the city bus service does not run on Sundays. A couple of food stalls and a cafe is present at the Lake. How popular is Lac De La Cavayere? People normally club together Basilica Of Saint Nazaire and O2 Aventure while planning their visit to Lac De La Cavayere. Relax ‘beach’ with beautiful views! Carcassonne beach. Worth the trip and you can actually get there by bus, but watch the timetable. Great place to chill out and relax or enjoy a walk around the lake.